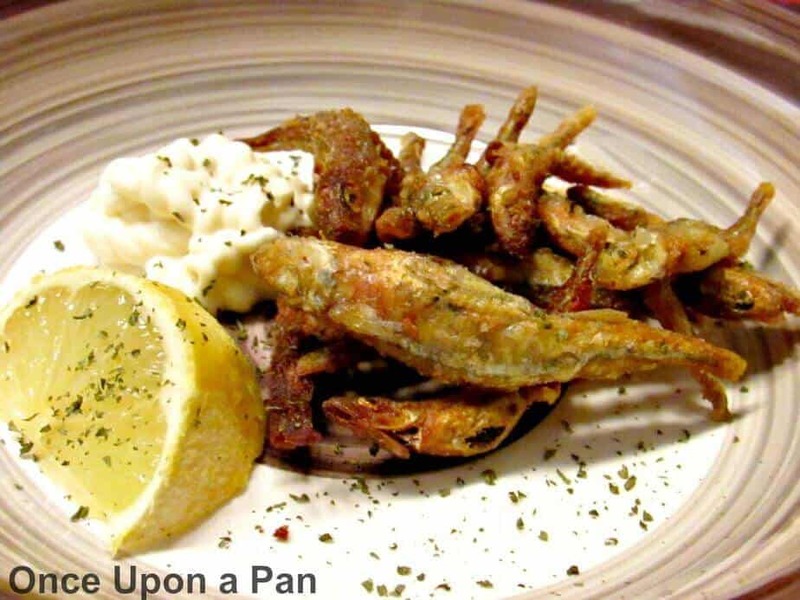 Let’s imagine a hot summer day… a really cold beer… and a plate of crispy fried whitebait! How does it sound? Nice, no? Well, this is one of our favourite scenarios that takes place in our back yard. It’s really nice to seat under the umbrella, put the TV on and nibble on some crispy fried whitebait with a refreshing beer or glass of white wine. Whitebait is an old English term for little tiny fish, dusted in flour and fried crispy. It’s largely popular in the UK since the 1700s when it was fashionable to dine on whitebait. But it’s also a popular dish around the Mediterranean like in Italy and in the Pacific like Australia and New Zealand. There are several laws around whitebait mainly because it consists of immature fry of many important food species (such as herring, sprat, sardines, mackerel, bass and many others) and it is not an ecologically viable foodstuff. But crispy fried whitebait was not new to me when I arrived to the UK. Back in Portugal we have a very similar delicacy. Maybe it’s not as small as the whitebait we find in the UK and for that reason we make a meal out of it instead of just a snack. But it is still as good! Preheat the oven to 95C/200F and line a baking sheet with paper towels. Pour enough oil to come halfway up the sides of a large deep saucepan. Heat the oil over high heat until 180C/350F on a deep-frying thermometer. Mix the flour, cayenne, and salt in a large bowl. Toss the frozen whitebait in the seasoned flour, making sure they are evenly coated. Place it in a large sieve and shake off the excess flour. Working in small batches, deep-fry the whitebait for 2–3 minutes, until they turn lightly golden. Transfer to the paper towels and keep warm in the oven until all the fish are fried. Serve immediately, with the lemon wedges and mayonnaise sprinkling everything with oregano or dill. Frying the whitebait in small batches will prevent them from clumping together and turning soggy.